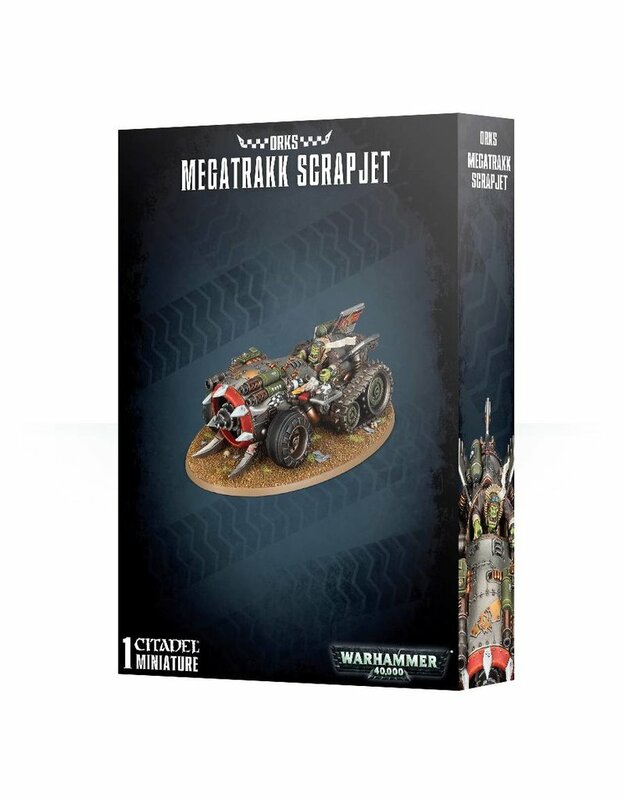 Built around the fuselage of a downed Ork aircraft, the Scrapjet is pretty much a metal tube covered in things that make enemies die – a front-mounted rokkit kannon (with belt-fed rokkits! ), missiles which can be modelled mid-launch, a drill attached to the front turbine with accompanying spiked rams, a twin big shoota at the front and another twin big shoota crewed by a Grot rear gunner. While the wings have been broken off in whatever terrible accident grounded the Scrapjet, it’s still covered in fins and ailerons – after all, they look cool, and that’s what being a Flyboy is all about! The pilot himself is decked out in a flight jacket, goggles and a long scarf billowing out behind him, seated in a cockpit full of instruments (which he is, of course, ignoring). The Scrapjet is propelled by a huge jet exhaust at the back, which pushes the vehicle along via the tracked wheels attached to the rear.